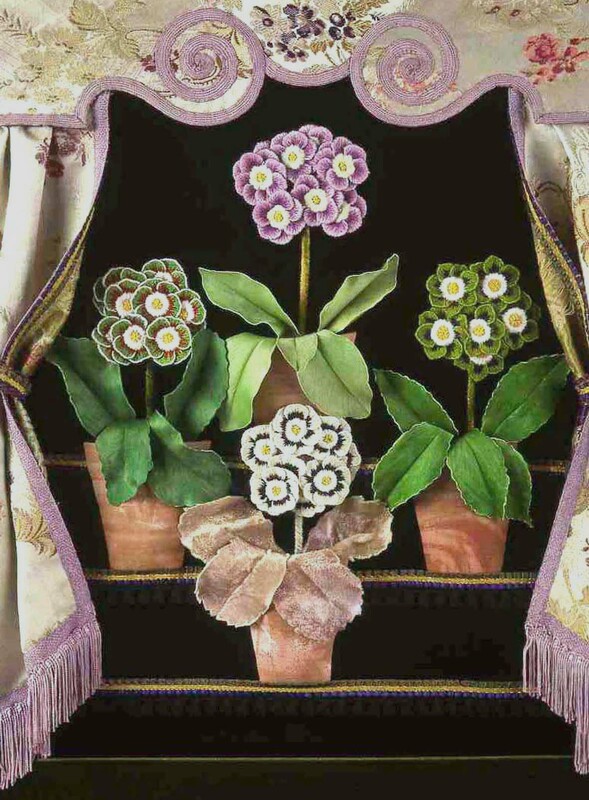 In an effort to be topical with the spring here at last, I am posting another of my Flora Embroideries, the Auricula Theatre. 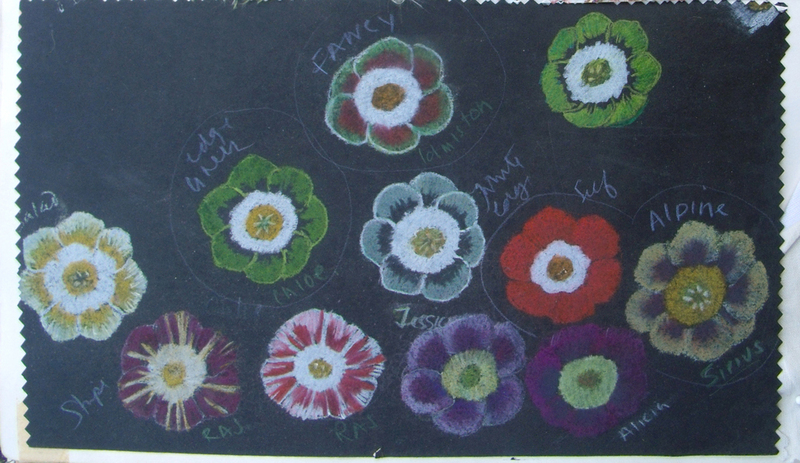 A strange idea to display flowers in such an artificial setting, I just had to embroider it – but needed quite a bit of help. In fact after the initial sampling I left the embroidery of all the dozens of tiny petals to my then assistant, Debbie Cripps, and a beautiful job she made of them. All I had to do was design and assemble the whole edifice. The theatres actually did exist and originally for a purpose other than display, the curious colours of some of the flowers is due to a farina or flour like substance that coats the leaves and petals giving them a white or silvery appearance and it can be washed away by rain – so the earliest flowers were often placed under protective coverings. 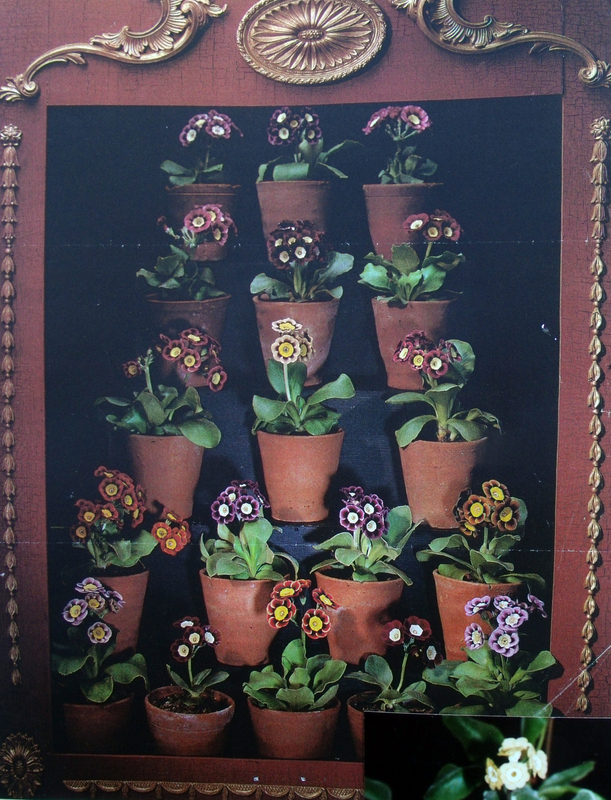 I became intrigued by the auriculas having seen them at spring flower shows – not in theatres but in simple plant pots; even in local church halls they really attract attention – they just don’t look real, they look like someone has painted them in strange colours with stripes and edgings of greens and white and yellows, they look like a child’s drawing of a flower. So I set about making one for myself, to become a permanent display. I arranged several of my photographs form the various shows I attended into a staged setting, then set about trying to embroider them. first I needed to draw them before I could start to stitch them. at first I tried to paint in the backgrounds, really to make things easier and quicker…. 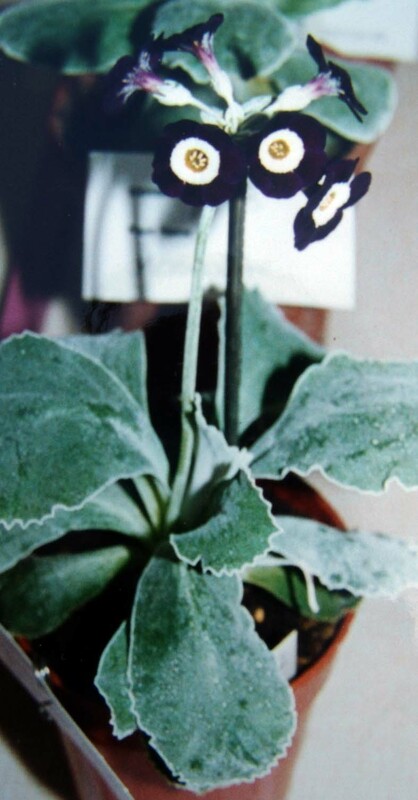 They looked OK but didn’t really have the intensity that the real things had, show auriculas look like imploded flowers so intense is their colouring and perfectly symmetrical their form. I realised that I had to make similar intense embroideries. 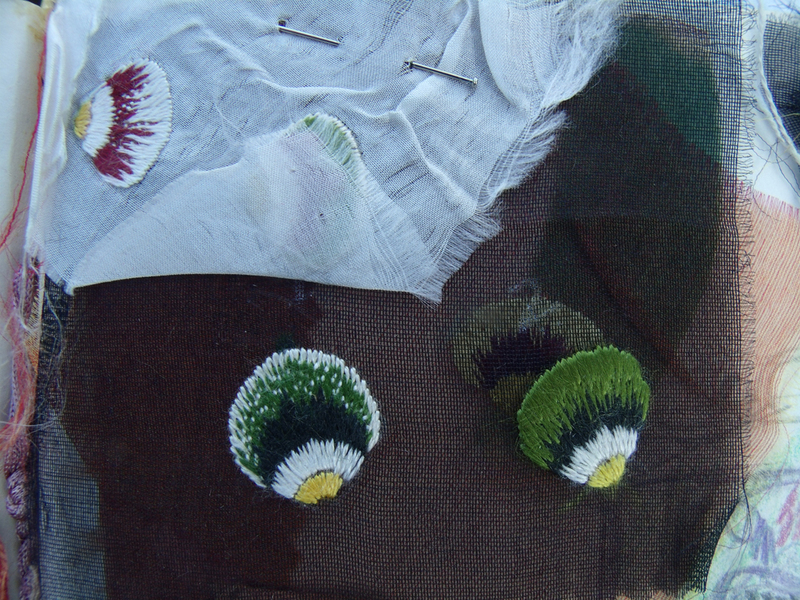 I started by embroidering individual petals.. I decided to try coloured grounds to make life a little easier. 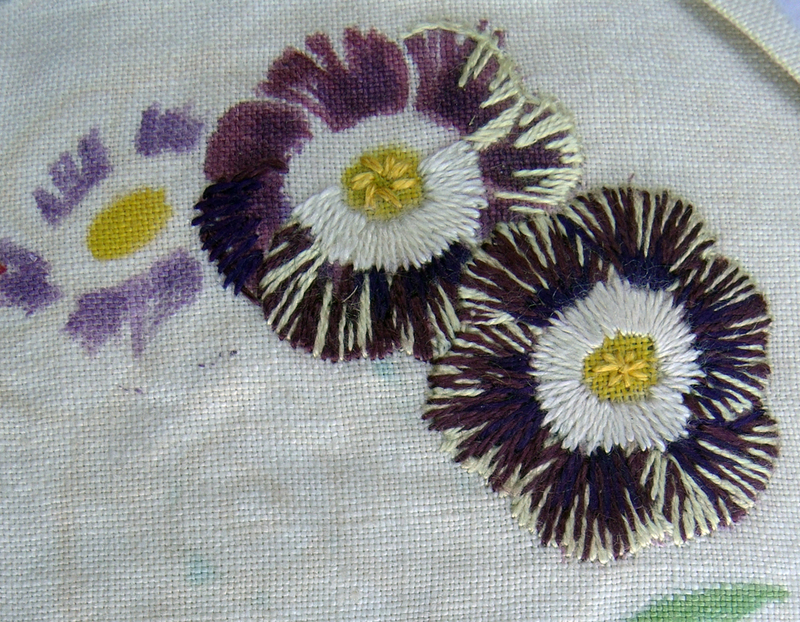 I used gauzes and fine silk grounds so that the made up flowers would not be too heavy but it was a bit of an awesome task even with help with the stitching. 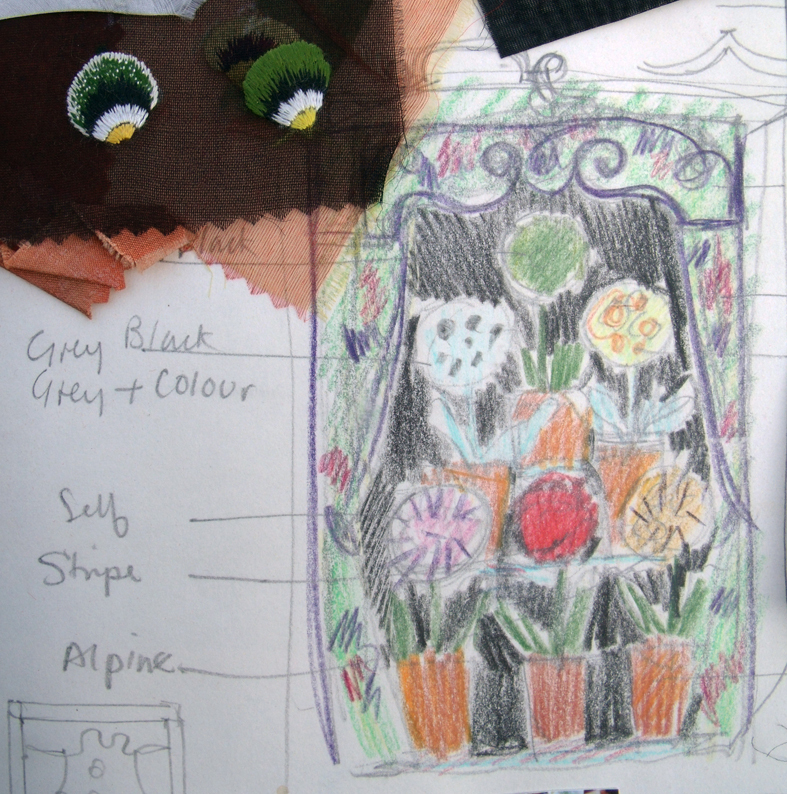 after giving the fabrics and my working samples to my assistant I set to work to develop the theatre. 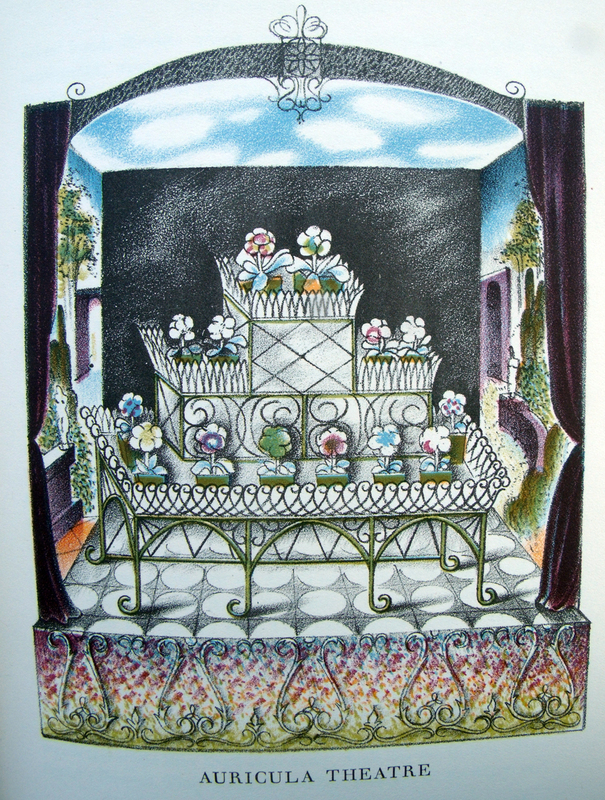 I know that this drawing is really simple and childlike but it was enough to get me started – I soon realised I had to make a 3D embroidery, so the curtains were lined and draped and the canopy was held above and projected out beyond the flowers, it was ribbon worked exactly as 17th century embroidered bed hangings. The earliest auricuals were grown by Flemish silk weavers and eventually shown in special competitions were prizes were awarded, usually a silver cup or spoon. 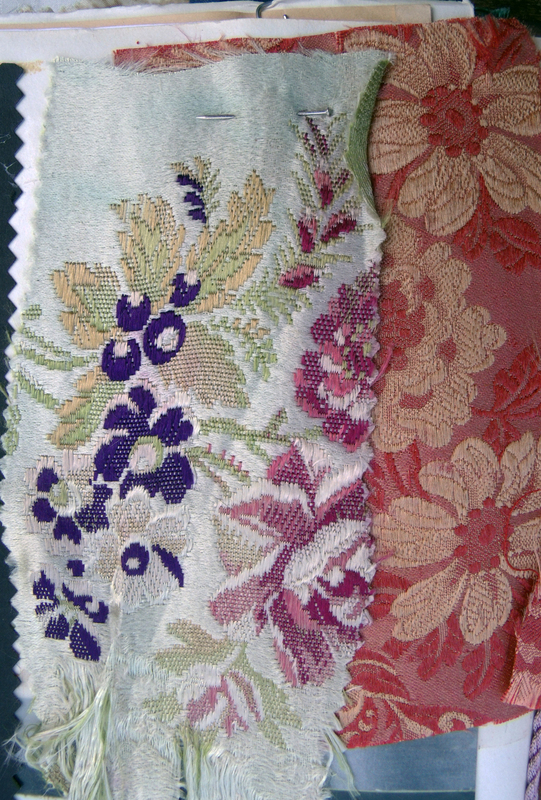 The Flemish silk weavers introduced them into England as early as the 17th century – so I decided to have curtains made from woven silk brocade that features auriculas ( you can’t say I am not thorough in my research)! 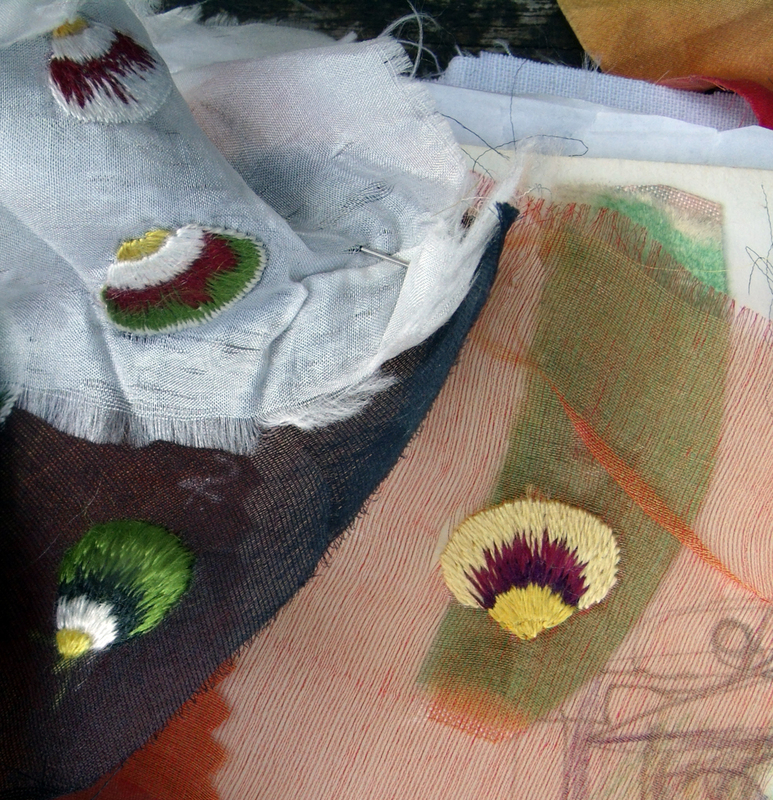 The finished embroidery is very 3 dimensional and is densely stitched and draped, it is the one piece of work that everyone wants to buy, probably because it featured on the poster for the exhibition at the Holburne museum in Bath where the whole set of Flora embroideries were first shown in this country. This was in 2000 so this is really old work now – but making this piece made me decide that I needed to start to develop new types of work using different media or techniques or both, this heavy stitched surface is too time-consuming and therefore too costly to sell except to a committed collector or dare I say it – museum? and I have decided not to separate the pieces because they tell a story of how, through trying to perfect nature we can go horribly wrong. I had stitched myself into a corner but I still had quite a few more pieces to complete The Flora set of work. 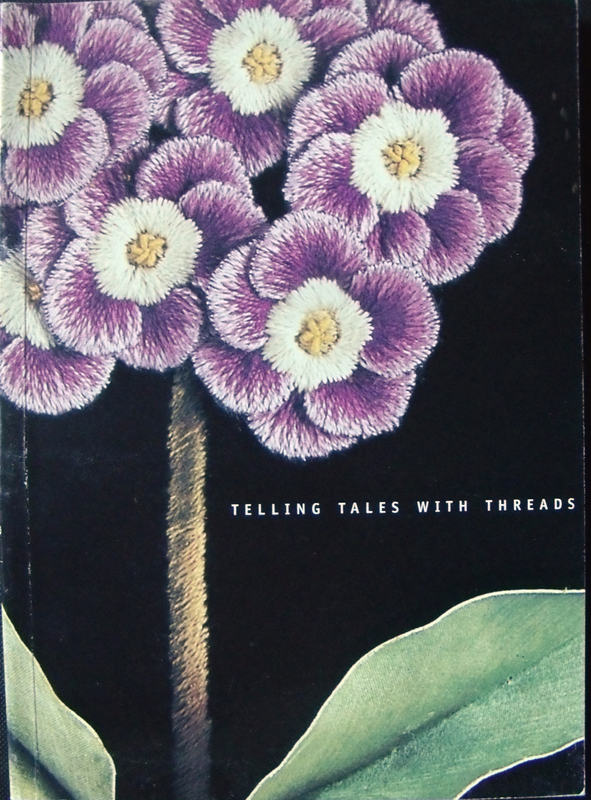 Categories: Drawing, Stitching, The Flora Embroideries | Permalink. 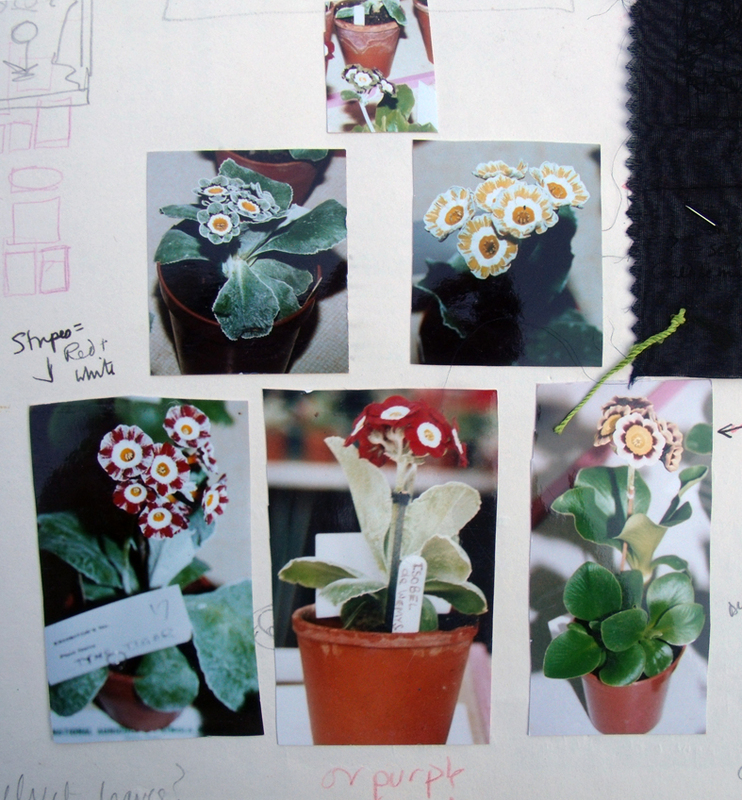 When I learned about this amazing way of arranging auriculas I knew I have to sew it. Thanks for this post – as for now your book was of a big help and now there’s even more.